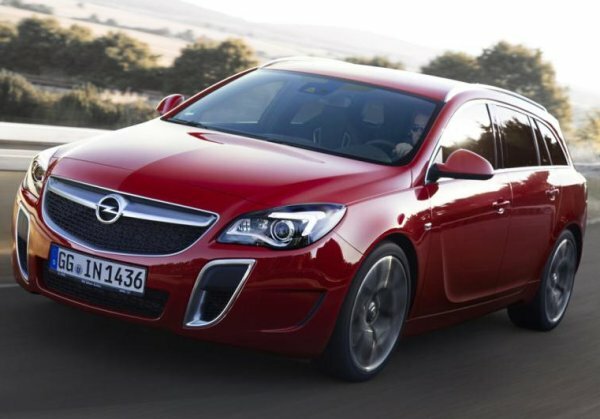 Among the debuts at the ongoing 2013 Frankfurt Motor Show is the new Opel Insignia OPC – the European version of the car that Americans know as the Buick Regal but the Opel version includes a wagon that we don’t get while the OPC package adds an all wheel drive system and a high performance drivetrain that we also don’t get. It had been rumored that the new Opel Insignia OPC would see a jump in the power output of the twin turbocharged V6 but with the Frankfurt debut, we have learned that those rumors are incorrect. The New Insignia OPC is powered by the same twin turbocharged 2.8L V6 with 325 horsepower and 321lb-ft of torque – not the 400 horsepower mill that rumors suggested would power the newest Insignia OPC. This engine sends that power through the buyer’s choice of a manual or automatic transmission to a Haldex all wheel drive system (just like the previous OPC package) but Opel’s performance engineers have tweaked the suspension setup and the electronic stability system to offer better handling. "The Insignia OPC dazzles with new radiance," says Michael Ableson, Vice President GME Engineering. "With great attention to detail, our engineers have given it some decisive fine-tuning. This is evident in its design and in its even better driving performance. This puts the OPC squarely in the first league of mid-size series production sports cars." Physically, the Open Insignia OPC is nearly identical to the Buick Regal GS with the exception of the Opel badging but under the skin lies a high performance drivetrain that would allow the Insignia OPC to put a sound thrashing to the Regal GS. In sedan form, the twin turbocharged Insignia is able to hit an electronically lmited top speed of 155 miles per hour while dashing from a stop to 62 miles per hour in 6 seconds flat. The OPC Touring shown above is able to hit 62 in 6.2 seconds en route to the same top speed. The bad news is that the Opel Insignia OPC package is not offered in the United States on the Buick Regal that shares so many other aspects. We do get to enjoy the Regal GS but with “only” 259 horsepower from the turbocharged 4-cylinder mill, our highest performance Regal is a far cry from the Insignia OPC. There is also the unfortunate point that the Regal is not offered in the very attractive wagon (Europeans call it a Touring model) form that the Insignia includes which is shown above. However, there have been spyshots caught of what appears to be a Regal wagon all camouflaged up that could elude to the introduction of a Regal sport wagon – or GM is just working on the Opel Insignia Touring here on the home turf. In any case, the Insignia OPC is an incredible example of what GM can offer in terms of a small performance sedan and with any help, the GM team will find it in their hearts to offer up something this spicy for the Buick brand in the near future.